My business trip on Monday really took it out of me and I reluctantly made the decision last night to postpone the blog by one day and write about my favorite restaurant today instead of Friday. So, if you were looking to lose a couple of pounds, you’ll have to wait until tomorrow. Today, I want to introduce you to Break of Dawn in Laguna Hills, Calif.
Part of the transition I’ve undergone on this blog is the move from mostly processed and fried foods to eating freshly prepared fruits, meats and vegetables. In my opinion, no one does that better than Break of Dawn, a tiny restaurant tucked in the back of a shopping center in the middle of some random South Orange County city. Chef Dee Nguyen cooks up Vietnamese-inspired global cuisine for breakfast and lunch. Choices include corned beef and hash, oxtail soup and meatloaf. I come over and over again because no matter what I order, I can expect it to be fresh and inventive. With the breakfast scene dominated by pancakes and bacon, a trip to Break of Dawn is always something special. I’m not going to write a full on food review, but I wanted to start with a quote, and then show you some of the amazing dishes served here. Born from that inspiration is an incredible menu. Check out some of the highlights from a recent visit with Wifey Nadia and friends. 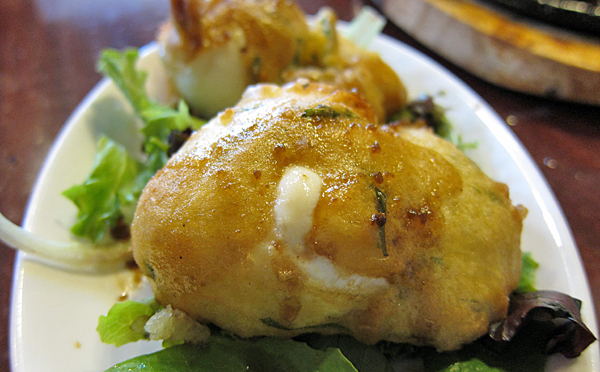 Tempura egg: Like a hard-boiled egg, except deep fried with a tempura “shell.” The inside is still yolk-y and when you slice through with your fork it all oozes out, coating a salad of lightly-dressed greens under it. I don’t know how they’re made (I’m thinking magic) and I’ve thought about asking the chef for the secret (who knows if he’d give it to me), but I find these too mind-blowing to really seek the truth. I’d rather just be impressed with their magnificence over and over again. Mac and Cheese: Sicilian sausage and short rib, bacon fried egg, smoked gouda-tomato carbonara. 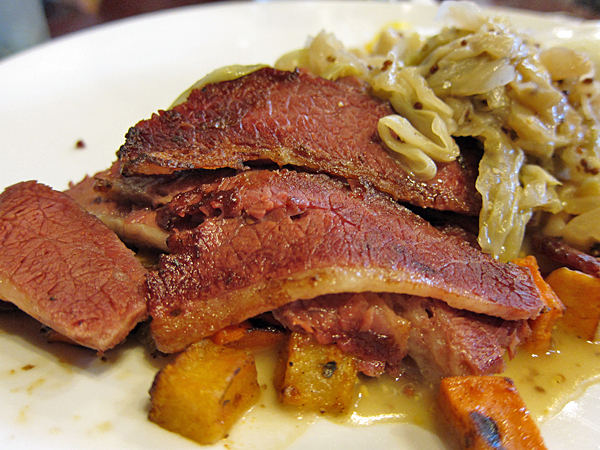 Corned beef, sweet potato hash, poached eggs, tarragon cabbage, mustard sauce: I’m not much of a corned beef fan, but the flavors of the sweet potato hash and cabbage when paired with the meat are out-of-control. 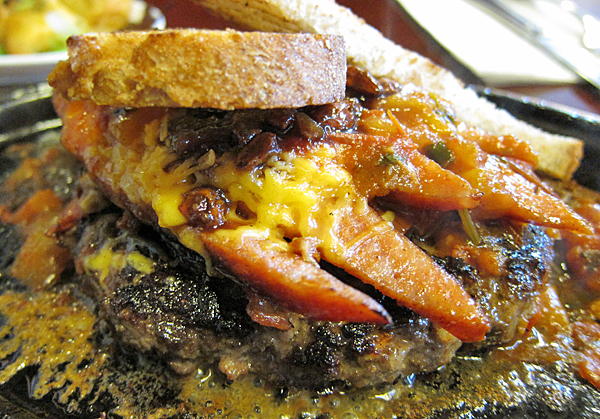 Elk burger with Portuguese sausage, cheddar cheese and goji berry and tomato ragout: Better, and beefier, than a burger made of beef: I’d order this again if it were on the menu, but alas, it was a special delivery. And hey, now I can say I’ve tried elk. Finally, the cinnamon roll: Served in a cast iron dish with the glaze still bubbling when it comes to the table. 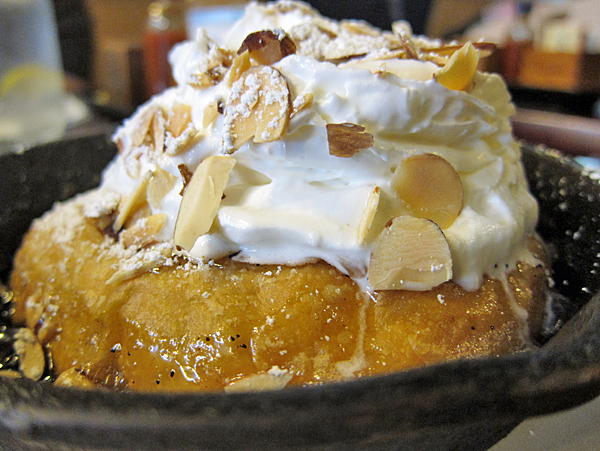 Topped with a healthy dollop of whipped cream and almonds. Light and fluffy instead of drowning in icing. Visit OC Register’s Food Frenzy for more pictures from Break of Dawn. 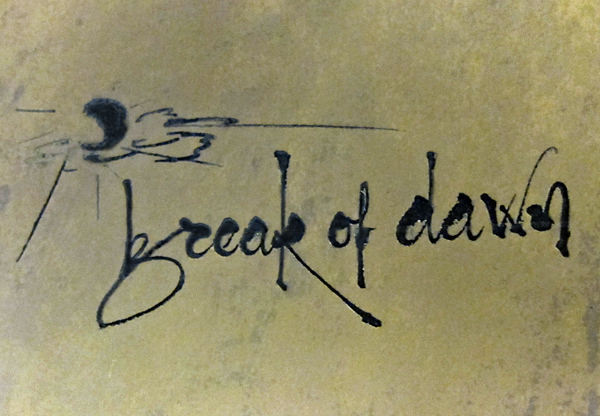 You can check out Break of Dawn’s website for business hours and directions. Just make sure you get there early. The place tends to get busy around 9:30 a.m. on weekends. Break of Dawn is just plain awesome. 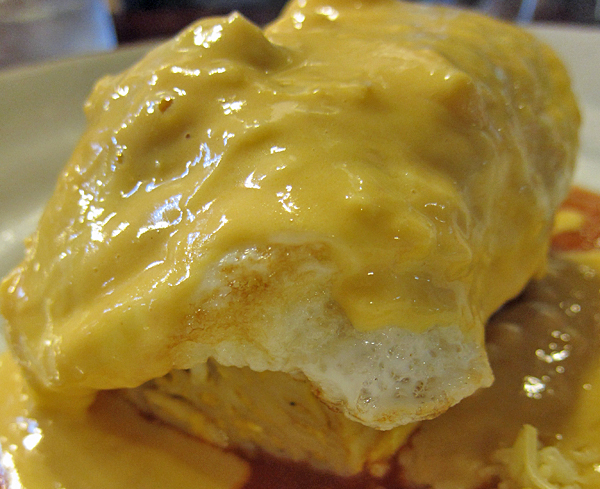 We had the tempura eggs last time we were there, amazing. Dan, I can’t agree with you more. Ridiculous foodz.